Secrets revealed! Blind items on Page Six. Which model was seen looking spectacular leaving which mogul’s Manhattan penthouse in full makeup and evening wear at 7 a.m.? Everyone loves the sizzle, the guilty pleasure of getting the gossip and the real story. 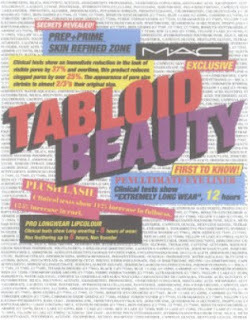 Our M∙A∙C Tabloid Beauty lineup is full of outlandish claims and shocking statistics – and they’re all TRUE! Our headlines are all amazing, all scientifically proven. Hot off the presses: Prep + Prime Line Filler improves firmness and visible lifting, with visibly diminished lines in eight weeks! Prep + Prime Skin Refined Zone immediately reduces the appearance of visible pores over time, reduces clogged pores by 25%, shrinking the appearance of pore size by almost two-thirds! 26% improvement in smoothness and skin tone, 24% reduction in sebum, 32% reduction in the appearance of pore size! Plush Lash boasts 112% increase in fullness, 125% increase in curl! Penultimate Eye Liner is extremely long-wearing – 12 hours! And Pro Longwear Lipcolour is non-transfer fixed, with no feathering for a full 8-hour day! And it’s all TRUE!